With my Midwest sensibilities in tow, I joined PPTC in 2013 after moving to Brooklyn. I was looking for new training buddies (friends) and found so much more. I’m a long time runner and natural motivator, and since my middle school days, friends and teammates have looked to me for advice and encouragement. I’ve been a driving force in the creation and continuance of the Marathon Training Group (MTG), and beyond my Team Captain duties, I enjoy giving back to the club by helping put on PPTC races and serving on the Board of Directors. When not running, you can find me frolicking around Prospect Heights eating ice cream (year round), making small batch pickles & jams, and laughing my way through life. I’m always looking for new training partners, so don’t forget to invite me out for a run! Training Goals: 3:07 marathon & being as good of a cowbeller as Adam Devine. I have been a club member since May of 2015, and at this point, it is hard to imagine how I survived so long without y’all. I had a bit of running experience back in my early 20’s, but was hit by a car while cycling back in 2008, and that put a damper on my running for a bit. Sara signed us up for the Brooklyn Half back in 2015, and we both had terrible races. But we both saw how much fun PPTC members seemed to be having, and decided we wanted some of whatever Kool-aid you all were drinking. Since then I have gotten more serious about running, completing a few marathons and a handful of ultra-marathons. I’m also trying to get a bit faster, and am inching towards my goal of breaking 20 minutes in the 5k. I owe almost all of my improvements to the support and motivation I get from the club. My favorite part about being a captain is getting to be a cheerleader for my teammates. I have gotten to know so many more members, and can’t get enough of screaming for them and banging away on my cowbell to cheer them to success. I am a better runner and a better person due to my membership in the club, and I can’t wait to share many more miles with everyone in the future. The racing bug bit me in May 2012 when I ran my first half marathon - the Brooklyn Half. Until then, I had an almost indifferent attitude toward running. I only ran because I needed to do something physical to counteract all the countless hours I spent sitting in front of a computer (like, writing up this bio). I fell in love with the excitement of a race atmosphere, the challenge of training and trying to meet big, hard, scary goals, but most of all I really really really love beating other runners. While I'm nowhere near being an elite runner, I love pushing and testing the limits of what I think I can do. There's nothing like the high of seeing all the weeks and months of training and sacrifice paying off in smashing a goal. My husband and I joined PPTC in late 2015 after we moved to Brooklyn. We were looking for a fun running club who wanted to be competitive, but didn't take themselves too seriously. PPTC fit the bill perfectly! Neither of us can imagine our lives without PPTC as nearly all of our friends in Brooklyn were made through the club. Along with being one of the captains of PPTC, I am a member of the Social Media Team of the Communications Committee and I occasionally lead themed runs (e.g., 17 mile to Mile 17, Halloween Candy Run). I look forward to expanding my role in the club as captain and taking charge of the idea that getting older means getting better and faster. After narrowly missing Boston by 28 seconds in 2018 and having the time qualifications tightened, I trained even harder ran the Phoenix Marathon in 2019 in 3:33:01, beating the time qualification by almost 7 minutes. Current goals: sub-22 5K, sub-1:40 half, running a half marathon in all 50 states before Jimmy does, and trying to keep up with Bandit, my puppy. In early 2015, I started running with the Couch to 5K app to lose weight. A friend of mine talked me into running the Bay Ridge Half that October, and I ran my furthest (8 Miles) the Thursday before the Bay Ridge Half. And while I couldn’t walk straight for next 2 days, I fell in love immediately with the distance. At the PPTC Turkey Trot that same year, I spotted all of these cool people in red jackets and it was then I decided to look into PPTC. 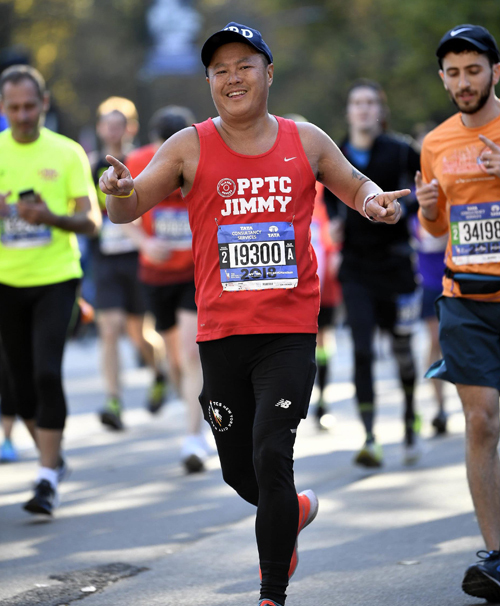 I joined PPTC to learn how to be a better runner in December 2015, but I was too intimidated and shy to show up to any club activities until the following April. I didn’t realize what I was missing out on. I soon fell in love with the club and found my new family. Many of you don’t believe this, but I’m an introvert and I’m uncomfortable being around people. However, a lifetime in public service as a US Postal Delivery Man, NYC Correction Officer, and NYPD Detective has helped me along the way to learn how to fit in. As the PPTC Masters Captain, it’s my hope to get masters runners more involved in our fun food and group runs. I see a lot of master runners during races, but I don’t always know who they are. My motto: You train better when you feed the mind and stomach! Let’s run together so we can race together against the other clubs. - Complete the Abbott’s World Marathon Majors (NYCM 2017,2018, Chicago 2017, Berlin 2017. Need: Boston 2019, Tokyo and London).